I love this book. I bought it last year, and have flicked through it a few times, but this time I sat down and read it from cover to cover in depth. The information design in this book is gorgeous and inspiring, and I spent ages poring over the diagrams and illustrations. There are diagrams on many different subjects, to the most popular baby names, to dictators wives… global warming to literature. It’s an interesting read as it is, even if you are not interested in the actual design side of the book, and because it’s a good design book, the information is laid out in a very well thought out way, making it easy to understand. 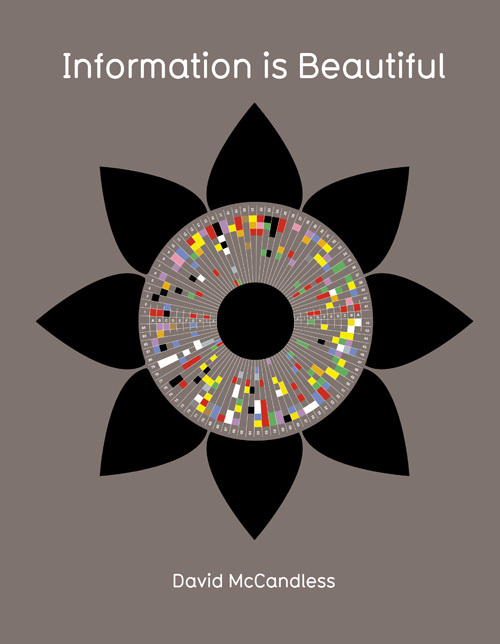 David McCandless, the author, describes himself as a “data journalist” or “information designer” and he designed this book to convey the facts and messages with the least amount of words, but the most amount of impact. The thing that hit me most amount these info graphics, is how lovely they are, without context I would want to put them on my wall, with context they are just even more awesome! I found it very inspiring, I love information design, and this book (and the accompanying website) are an awesome selection. I would definitely recommend this book to anyone who likes art and design, as well as anyone who wants an interesting fact book to dip into.